Small drones are becoming increasingly popular for tasks ranging from inspection of hydro lines to spraying of crops. Critics warn of an airspace teeming with these unmanned aircraft. 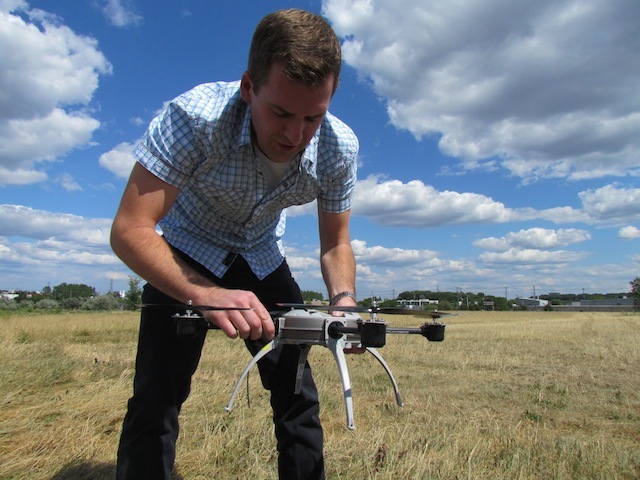 Join a test flight with Canadian drone maker Aeryon Labs. A backpack zips open to reveal the components of a small drone: a cylinder-shaped body, rounded legs, stems with small rotor blades, and a square battery. “We’re going out flying,” says Ian McDonald, a vice-president with Aeryon Labs, a Canadian tech company that has supplied small drones to police forces, oil cleanup teams in the Gulf of Mexico, and the rebels in Libya. The Scout’s parts fit in a light backpack. Quickly, McDonald snaps the legs and wings onto the body. The battery fits on top. A small round video camera, a movable electronic eye, is attached to the bottom. 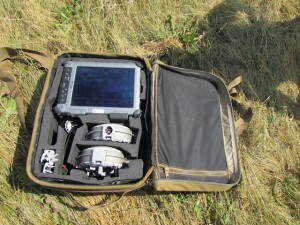 A tablet computer with a touch screen is powered up to pilot the drone, known as the Scout. Within minutes, the device weighing a couple of kilograms is ready for takeoff. McDonald taps on the map on the screen to indicate where he wants the drone to go, and the Scout flies to the spot. 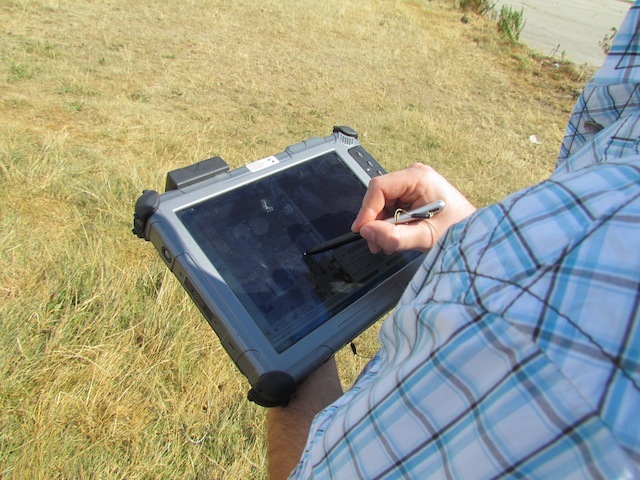 A vertical slider is used to determine the altitude. Within no time, the small aircraft is hovering a few dozen meters above the ground, sending back detailed images of the industrial park, the field, and the pilot below. Ian MacDonald of Aeryon Labs quickly assembles a small drone. In other words: the drones are coming. Although the use of unmanned aerial vehicles (UAVs) is still restricted in many countries, observers are predicting that within a few years, the world’s airspace will be teeming with small drones with electronic eyes in the sky. In North America, it is estimated that within 10 years, some 30,000 unmanned aerial systems will be in use. These aren’t the large, military drones that dominate international headlines, like the armed Predators and Reapers that are used by the U.S. military in the controversial campaign to bomb suspected terrorist targets in Afghanistan, Pakistan, and Yemen. Rather, the coming wave consists of small, light aircraft such as the Scout, Draganflyer, Qube and other models, which are relatively cheap and can be deployed with minimal training. As drones have become more advanced and cheaper – full sets can be bought for a few tens of thousands of dollars; more advanced systems can cost up to $250,000 – their use is becoming increasingly attractive for missions that are ‘dangerous, difficult or dull’ for manned aircraft, in the lingo of the sector. Examples include keeping track of forest fires, searching for missing hikers, inspection of oil pipelines and the spraying of crops. Other applications vary from surveillance to commercial use for photography of real estate and even the production of Hollywood movies. Others do see such reasons. Critics are worried about the prospect of swarms of drones that hover around, spraying, measuring and filming, and keeping a watchful electronic eye in the sky. They say rules are urgently required to avoid deadly accidents and abuse. Concerns are focused on two main areas: air traffic safety and privacy violations by cameras in the air. As for safety, some fear that unmanned aircraft can collide with planes with people on board. “There’s a very real danger of too many of those things flying around, so there will have to be some rules,” says Douglas Marshall, a professor at New Mexico State University and a member of a commission in the U.S. that is drafting rules and standards. The difficulty, he says, is that drones don’t have the capacity to instinctively avoid other objects in the sky. In the U.S., the Federal Aviation Administration generally does not yet recognize unmanned aircraft because by definition they don’t meet the safety standards that are in force for manned planes. For that reason, they cannot be flown in the U.S. However, special permits have been granted to about 300 organizations, mainly police forces and research groups. Since this spring, police and fire departments can get fast track approval. Moreover, Congress has mandated the FAA to develop rules to facilitate the general use of drones starting in September of 2015. Recently, draft rules have been presented to allow the use of drones on a limited basis: they cannot weigh more than 55 pounds (25 kilograms) or fly higher than 400 feet (122 meters). They must always stay within the line of sight of the pilot, and stay away from airports. Users must obtain a license and submit a flight plan. Perhaps equally thorny is the issue of privacy. Opponents of large-scale use of drones by police forces, including the American Civil Liberties Union (ACLU), warn of a scenario where the government, like Big Brother, literally hangs over people’s heads with the capacity to keep an eye on them for long periods of time, even in their own backyards or through the windows of their homes. Not to mention the tricks paparazzi could pull off with drones. The person piloting the Scout points at a place on the map, and the Scouts goes there. Still, there is already a legal test case: police in North Dakota called in a drone last year to spy on a man who was suspected of stealing cattle and building a barricade on his land to resist possible arrest. Using information from the drone, police were able to take the man into custody without a firefight. But he wants to challenge the charges against him in court because of the method used.